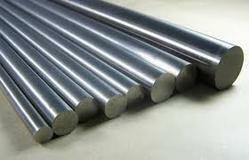 Exporter of a wide range of products which include molybdenum round bar. Forged with our open die forging process, individually forged blocks from Mattco Forge Inc. offer a number of advantages over rolled or extruded plate or bar. In the missile industry Molybdenum is used for: nose cones, high temperature structural parts, nozzles, leading edges of control surfaces, support vanes, re-entry cones, and heat radiation shields. In electronics Molybdenum is used for: cathodes, magnetron end hats, x-ray tube components, filaments, and glass-to-metal seals. In high temperature applications Molybdenum is used for: furnace windings, structural furnace members, and containers for components exposed to high temperatures. Molybdenum is a refractory metal that is very useful in many industrial processes and applications that would not be possible with many of the more common metals and alloys. Refractory metals and alloys are extraordinarily resistant to heat and have unique physical properties. We are specialist in Mumbai metal market for pure moly metals 99.9%. We are importer and stockist of Molybednium Material in pure grades in form of Wire, Rod, Pipe, Tube, Sheets, Plates, Flats, Strips, Flanges, Fittings, Nut Bolts, Sleeves. We will offer the material as per customers requirements as per cut size and as per required size.